Over the weekend, I was sitting with the daughter on the couch, watching MST3K Gamera movies and old Spider-Man cartoons on Netflix and watching her use Fabrica Herois to make public domain superheroes. 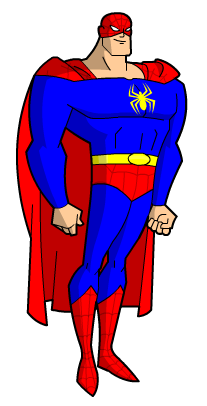 While she was doing that, an idea popped into my head of what Spider-Man might have looked like had he been invented in 1938, and likewise what a 1960’s Superman might have looked like. 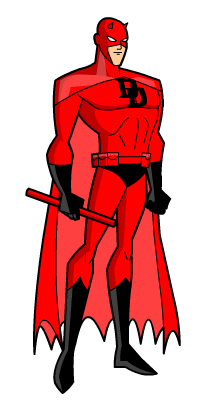 So, seizing the laptop I put together some notions on interposing Spidey and Supes, and then Daredevil and Batman. Here, then, are my “What If?” origins of these characters and their little costume sketches. Daily Bugle photo-journalist Peter Parker has been everywhere and done everything while snapping pictures for his hard-nosed publisher, J. Jonah Jameson. Maybe his most fantastic adventure occurred in Cairo, when he was accosted in a dark alley by a desperate old man who pressed a strange little golden amulet into his palm. The man, it turned out, was on the run from art smugglers. Putting on the amulet, Parker discovered he gained the powers of a spider! Using these powers and quickly crafted mask, he foiled the smugglers and turned in the expose’ to Jameson. Back in New York, he continues to fight crime as the mysterious Spiderman, all while dueling ace reporter Betty Brant and dallying with fashion model Mary Jane Parker. His aunt, May Parker, still lives in the Forest Hills section of Queens. Young brainiac Clark Kent lives with his parents, John and Martha Kent, in the suburbs of Metropolis. Late one night, Clark gazes at the sky with his telescope and sees a meteorite streak out of the sky, striking nearby. Clark sneaks out of the house on his bicycle and discovers the glowing green meteorite in a nearby park. It bathes him with its rays, and Clark soon discovers by accident that he has gained tremendous powers. Enjoying his new power, he becomes a show-off and misses a chance to save his father’s life when he suffers a heart attack. Realizing his error of his ways, he dedicates himself to helping people with his powers. Clark now tries to balance high school, crime fighting and a job as a cub reporter at the Daily Planet – not to mention his love interests – ambitious fellow cub reporter Lois Lane and pretty girl next door Lana Lang. Matt Murdoch grows up in Hell’s Kitchen with his father, a boxer. When gangsters of Boss Fisk kill his father, Murdoch makes a solemn vow to destroy all crime in New York City. To this end, he trains mind and body, becoming a crusading lawyer as well as studying under Tibetan yogis, who teach him to “see without eyes”. He adopts the guise of a devil in order to frighten criminals who are a “cowardly and superstitious lot”. While his arch enemy is Boss Fisk, the “Kingpin of Crime”, his most interesting foe is the seductive Russian-born cat burglar known as “The Black Widow”. As a youth, Bruce Wayne is struck blind when he is struck by a radioactive rod that flies out the back of a van driven by gangsters who have just stolen an x-ray machine from his father’s medical practice. The rod steals his sight, but gives him the echo-location abilities of a bat, along with other super senses. He soon discovers that his father, a widower, has been killed in the robbery. Inheriting his wealth, Wayne builds it into a vast industrial fortune that he uses to bankroll his war against crime in Gotham City, which he fights as Batman, the Man Without Fear. ← NOD 10 Goes Live! That Superman costume is AWESOME. I would have been tempted to steal it for Dark Renaissance – I may still yank it if I ever get around to running my own Mystery Men game. I sort of dig the general idea of this post as well. Spiderman still looks a bit too “super”. Super-Man and the rest are a nice blend. The backgrounds are excellent fodder! I did something like this in an alternate superhero world long ago. The Super-Skrull became Superskrull, last survivor of the Skrull Homeworld, rocketed to Earth as an infant, etc. The Lexx-Men, led by Professor Luthor & youngsters from his Brotherhood of Gifted Mutants. The Iron League, led by evil businessman Tony Stark along with such villains as Mr Lash (Reed Richards), Ms Spectre (Sue Storm), Gold Lantern (Ben Grimm – who was also a pilot originally), & Flamestrike (Human Torch). Oh, to have a group to run this type of game with again! Nice backgrounds. I especially like Spiderman with his scarab and the Daredevil using the guise of the devil for the same reason DC Batman does. I'm not sure what it says that DCing Marvel heroes appeals to me more than Marveling DC heroes.